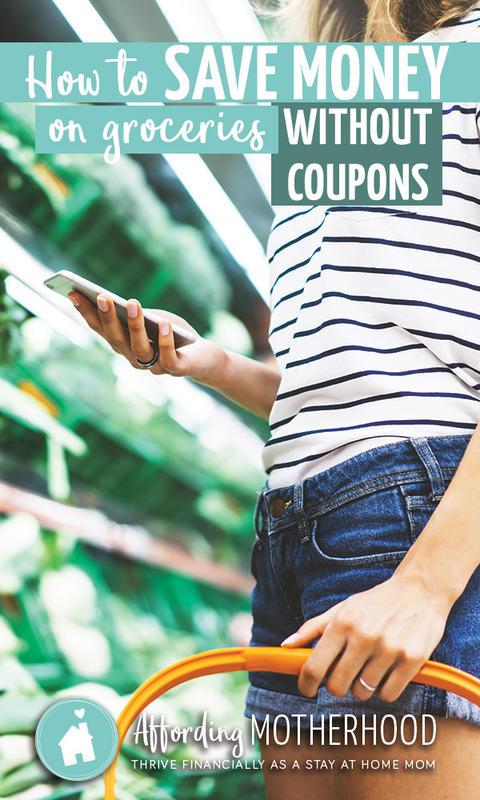 This is the ultimate list of tips and resources for how to save money on groceries without coupons – and still feed your family the healthy food they love! A couple of years ago my grocery spending was out of control. As a mom, I was determined to feed my growing family the healthiest food possible. The only problem was, it was killing our budget – keeping us in debt and jeopardizing my ability to stay at home with our kids long term. I knew what I needed to do, but the timing could have been better. I was already overwhelmed, with a newborn and a toddler at home. We were living on one low income and had only one car which my husband needed to get to work, so it was unthinkable for me to run around town trying to shop for deals. 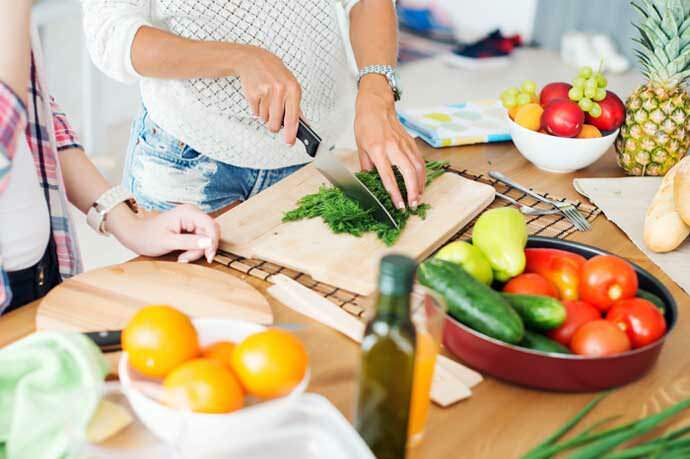 As impossible as the situation felt, I was resolved that I would find a way to save money on groceries one way or another, so I could stay at home with my babies – without compromising our healthy diet. An amazing 9 months later, we had completely paid off our debt. There were many factors that played into our getting out of debt so fast, but one of the key ingredients was the simple grocery savings system I developed. That first year, I used it to cut our grocery budget in half! And I continue to use it to feed my family healthy, real food on a budget month after month, without clipping coupons or shopping sales. 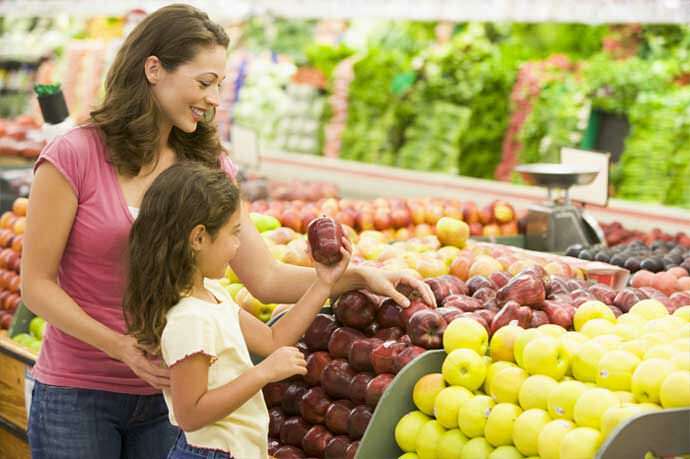 Now, I’m excited to share some of my best grocery savings tips with you. So, how do you save money on groceries without coupons? Let’s dive in! Visit my chart of average grocery budgets per month to find out how your grocery spending measures up. There is a range of average food costs from the “Thrifty” to the “Liberal” food plan. 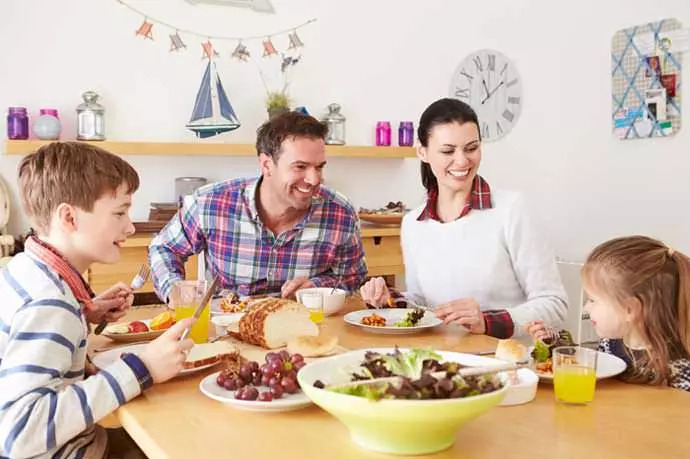 In my experience, you can feed your family healthy food even on the lowest tier. The cheapest food is what’s already in your refrigerator and on your shelves, yet the average family throws away hundreds of dollars worth of food every year. Don’t settle for the status quo. Make sure to plan to use up your left overs. Take stock of what’s in your pantry, and, once in a while, try a grocery budget challenge and cook only what you already have on hand. 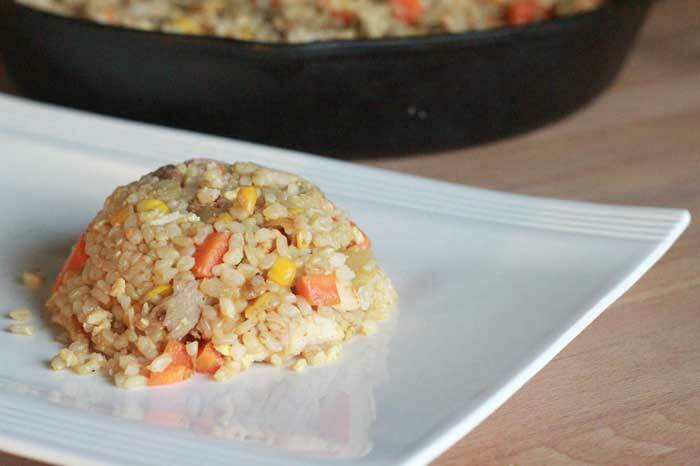 It’s great to know a few flexible recipes that let you use what you have like chicken fajitas or “Use-What-You-Have” Leftover Fried Rice. If you’re totally stumped, try out this Use Up Leftovers search engine. Enter three ingredients you have on hand and it will serve you up dozens of recipes you can make. Fun! Be sure to try this tip to save $100 on groceries…in under a minute. It’s one of my favorite easy ways to save on groceries by using up leftovers. Cooking from scratch can save money on groceries. In fact, cooking something from scratch instead of buying pre-packaged saves around 50 percent, as a rule of thumb. That can really add up fast! But as you know, it takes a lot less time to pop open a box of Oreos than to bake homemade cookies. So, how can you make the biggest impact on your budget without spending all day in the kitchen? To get started cooking more from scratch to save money, I recommend you pick just a few items to make from scratch at first that will save you the most money. Even very simple switches like cooking dry beans from scratch instead of using canned can save money. Then, take the time to get organized. 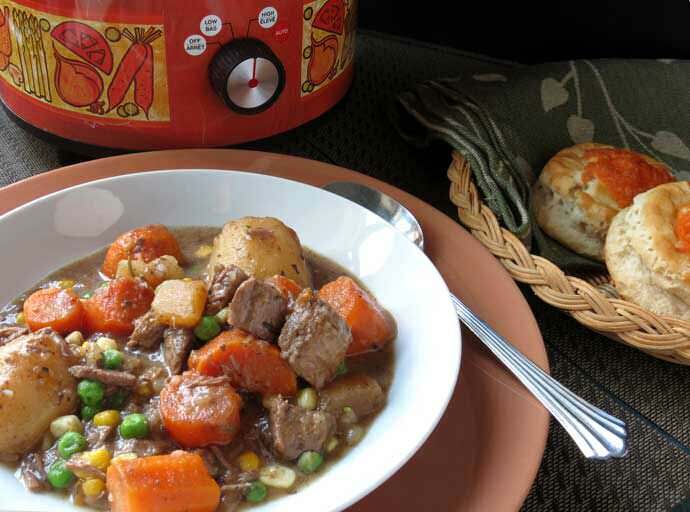 Create a scratch cooking routine that you can do on a consistent basis to save time and money. If you do this, you’ll see dramatic results in the speed of your cooking within a week or two. The more you do it, the easier, and faster it gets. Here are a couple of my favorite recipes that can help you save big. Some of the highest priced items in your grocery basket aren’t food at all but cleaning and personal care supplies. Make your own with these DIY cleaning recipes, or simplify your routine altogether by cutting out unnecessary products. Next, we come to everyon’es least favorite aspect of grocery savings…meal planning. How do you find time to meal plan? My advice, as always, is to keep it simple! At first, don’t worry about finding the most beautiful Pinterest meals or the most frugal budget-friendly recipes. You’ll save money if you simply have a meal plan. It will cut down on trips to the grocery store for ‘just one more thing’ you needed for dinner, or grabbing take out, and a meal plan will help make sure you use up the things you buy. Here’s some frugal meal planning inspiration. Although I don’t recommend trying to drastically change your recipe repertoire, it’s always handy to have a collection of frugal recipes on hand, especially as you get ready to entertain or need a dish to take to a get-together. To be sure, you can afford to eat meat even on a tight budget. Once in a while though, stretch your meat in dishes by pairing meat with beans or eggs, or plan a vegetarian meal. One of my favorite one-pot meals that uses this trick is my Fast and Frugal Frittata recipe. It’s so quick and easy for busy nights. All the time, I have moms email me thinking they need to feed their families cheap, empty carbs in order to save money on groceries. Thankfully, that misconception simply isn’t true. That fiber also helps stabilize blood sugar, so you don’t feel hungry 20 minutes after you’ve eaten. Real food provides the micronutrients our bodies are hungry for. Over the long-term, people who eat healthy real food diets report they often end up eating less while being more satisfied than with processed foods. And I don’t have to tell you how prioritizing your health now can save on future healthcare costs. So, when your kids come looking for a snack, don’t be afraid to offer them a whole fruit or another filling and delicious snack even if it’s a touch more expensive that other alternatives. 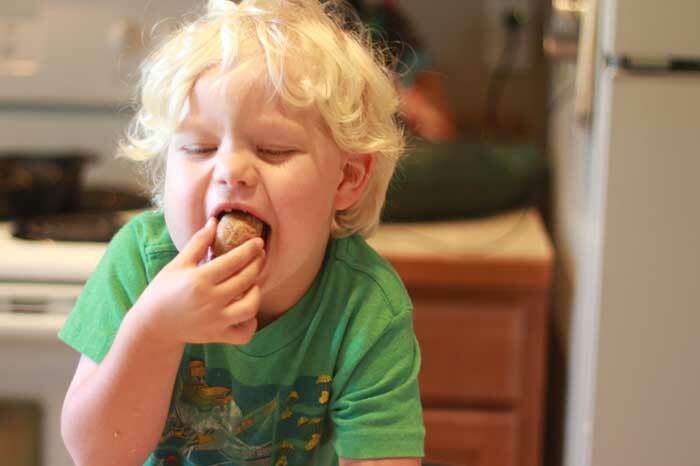 One of our family’s favorite healthy snacks are these Disappearing Peanut Butter Cookie Dough Bites. With just 6 ingredients you can whip them up in minutes. As I already mentioned, getting organized with a simple meal plan can help cut down on eating out. Another way is to prepare freezer meals ahead of time for busy nights. I love this list of copycat recipes from some popular restaurants for when you want your fix without the restaurant price. One of my favorites is this Baked Kentucky Fried Chicken Recipe. Yum! Also, be prepared with recipe ideas for times you know you won’t want to cook, like when it’s hot and you don’t want to heat up your kitchen or you’re just too tired. Here are some of my top picks. Here are my top 12 kitchen must-haves on a budget that will make home cooking a breeze. The next step is to compare prices on the foods you buy most often at a variety of stores to get a good idea of where to shop. To get started, download a free printable grocery price list and start comparing! Speaking of comparing prices, online grocery shopping makes that super easy. Plus, you can pick up your groceries or have them delivered to your door without ever stepping foot in the grocery store. 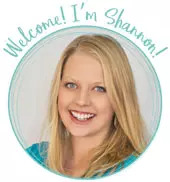 Online grocery shopping really is God’s gift to busy moms! 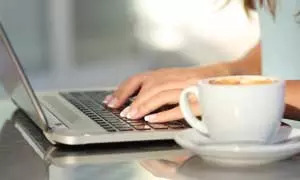 Here are a couple of my favorite resources for shopping online. Shop locally to save from spring to fall in most parts of the country. 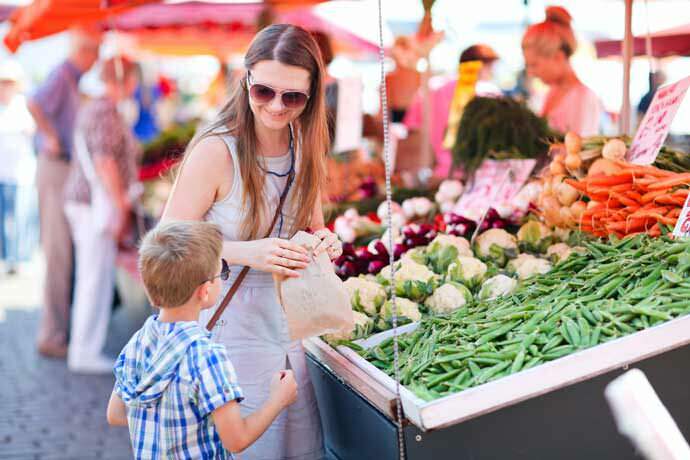 You’ll not only save on groceries, but also visiting local farms and farmers markets is a fun family activity. By the time you finally make your grocery shopping list, you’ll already have a good idea of where to shop and what to buy for the best prices. Now, it’s time to start shopping! You’ll save money just by writing a list in the first place and sticking to it while you shop. Of course you already know, don’t go to the store hungry and do choose generic items instead of name brand. Remember though, the advice I always give my grocery savings students is to stay out of the grocery store for the most savings. Instead, buy in bulk, shop locally, and minimize trips to the store by planning ahead as I’ve already mentioned. If you stopped there, you’d already be well on your way to big grocery savings. However, I recommend putting a fail-safe into your savings system, to make sure you stick to your budget. As you shop, track how much you’ve spent and how much you have left. Simply note it down right on your list as you shop or use an app like Out of Milk. I hope this has given you some useful tips to help you start saving on groceries. But I know what you need isn’t a bunch of tips for saving money. What you really need is a proven system that works for YOUR family. If you’d like to take the next step in creating your own grocery savings system, tailored to your unique family, I’ll be walking a limited number of students through doing just that very soon. I would love to have you join me. Click to learn more and to register. Whether you do it on your own or with my help, I want to encourage you…you can do this! I wish you all the best as you learn to feed your family healthy food on a budget. 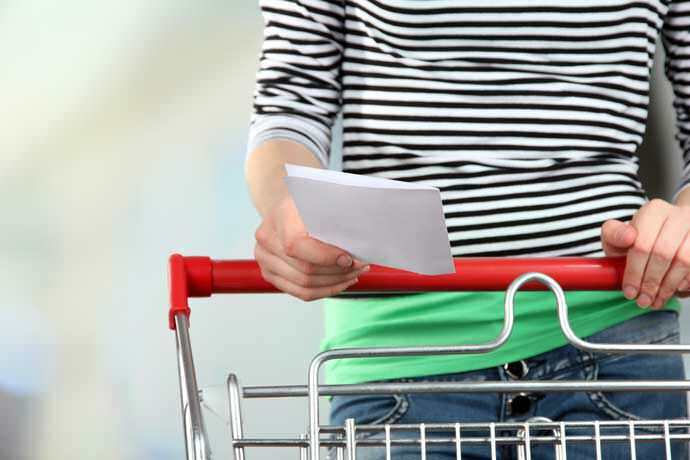 yep, shopping planning is a crucial step for saving on groceries. We can save a lot of money just by buying only necessary items.